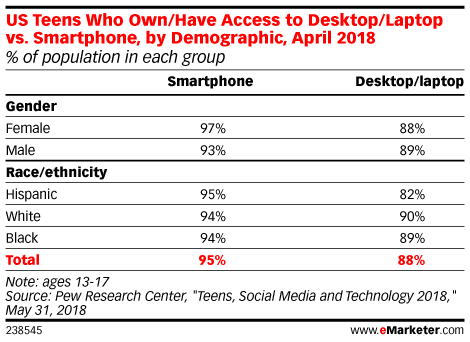 Data is from a May 2018 Pew Research Center report titled "Teens, Social Media and Technology 2018" conducted by NORC. 743 US teens ages 13-17 from NORC's AmeriSpeak panel were surveyed online and via telephone during March 7-April 10, 2018. Additionally, 1,058 parents from the panel who have teens ages 13-17 were surveyed. The Associated Press-NORC Center for Public Affairs Research at the University of Chicago is a social science market research center focused on news.